What I’m cooking: Lots of brains! (Not zombie style). My little berry’s brain is developing at a crazily fast rate, with 100 new brain cells created every minute – if only mine were doing the same! Main symptom: Anxiety. This is the furthest I’ve been in pregnancy by quite a stretch, and I’m past the point where pregnancy tests are useful. Having symptoms makes me feel like crap (mainly fatigue still! ), but having no symptoms makes me completely freak out. 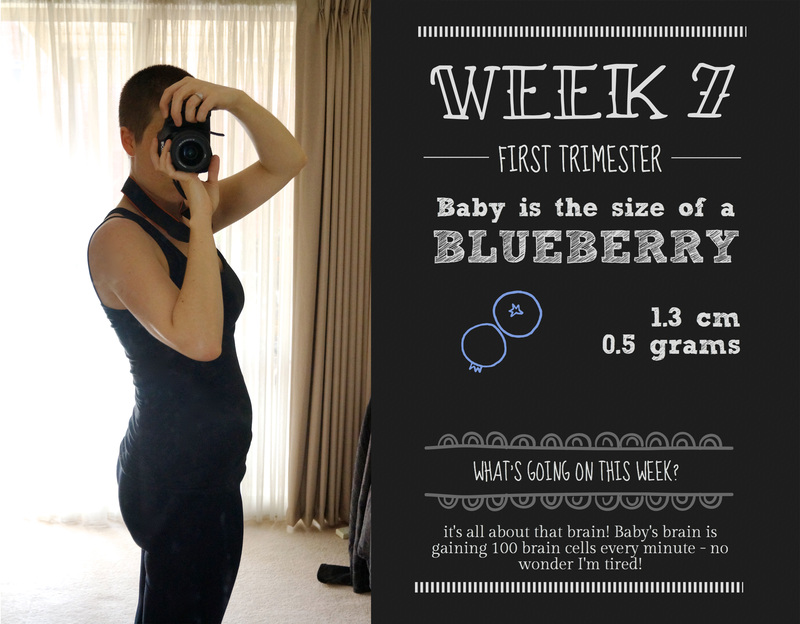 What’s on this week: Still on holidays, but this week is a biggie – my first ultrasound! Massive fingers crossed for a wiggling little blueberry with a strong heart rate. Now I’m in the Week 7 zone (today is 7w2d, I’m running a little behind! ), the risk of a miscarriage has dropped substantially, to under 5%. This is a huge relief, however most of these statistics are based on having had an ultrasound where a heartbeat can be seen. So, that brings me to Wednesday – my first scan! From what I’ve read, it should be a transvaginal scan (all about those here), especially as for one of these I don’t need to drink water beforehand (which they haven’t asked me to do). This should provide a clearer picture and chance of seeing/hearing the heartbeat than a standard abdominal ultrasound. I’m completely counting down the minutes until the scan – although I’m sure I’ll find something else to worry myself over, knowing that my little berry is growing, is at the right level of progress and has a strong heartbeat will be a huge comfort. So, as you can tell, I’m a bit of a nervous wreck this week, swinging between all the symptoms and none of them. This whole pregnancy thing is a scary roller coaster at times, I want to enjoy each week so much, however the nerves get to me so often it makes it tricky to actually believe there is anything going on at all, or that if there is, I can’t help thinking it all might end tomorrow. I obviously need to work on my positivity!